Does genomic evidence make it scientifically impossible that the human lineage could have ever passed through a population bottleneck of just two individuals? This is a question I am asked semi-frequently by religious friends. With my current understanding of the genetic evidence, I can’t state categorically that it’s impossible. In this view, I find I differ from a recent book chapter on the topic. I’m writing this blog to run my thoughts past other biologists, and check I am not missing something. The issue is this. Believers in Abrahamic religions who accept evolution often combine it with belief that all humans have descended from a single couple. Until now, many have assumed that this belief is compatible with evolution and mainstream science. This needs to change, according Christian biologist Dennis Venema writing in the 2017 book Adam and the Genome. Chapter 3 of this book claims that three population genetic studies give independent estimates that the population size of humans has never dropped below around 10,000 individuals. Venema declares that a bottleneck of two is impossible, and this is a fact of comparable scientific certainty to heliocentrism. He gives his Christian readers a stark choice between embracing mainstream science, or sticking with untenable beliefs about an ancestral couple. This is fine, so long as mainstream science really is showing that a single-pair bottleneck somewhere in the history of humankind is an absolute impossibility. But having looked at the evidence that Venema describes and cites, I am not yet convinced. I can’t echo him and say to someone who believes in an extreme human population bottleneck that they are against science. I will explain my reasoning, taking each of the lines of evidence that he cites in turn. If a species were formed through such an event [by a single ancestral breeding pair] or if a species were reduced in numbers to a single breeding pair at some point in its history, it would leave a telltale mark on its genome that would persist for hundreds of thousands of years— a severe reduction in genetic variability for the species as a whole. One such species with a profound lack of genetic variability is the Tasmanian devil, a carnivorous marsupial once found across Australia, but now solely on the island of Tasmania off the Australian coast. Tasmanian devils have had very little genetic variability for the last few hundred years: most of them have exactly the same alleles with only rare differences. The implications are clear: Tasmanian devils experienced a severe bottleneck in the distant past, but humans did not. It is a bit of a leap to say that if humans had passed through a bottleneck they would have similar levels of genetic diversity to Tasmanian devils. Whilst it seems clear that the Tasmanian devils have passed through a bottleneck, not all bottlenecks are the same. They can differ in their length as well as in their intensity, and a short bottleneck has less severe consequences than a long one. A short, sharp bottleneck is all that is needed for the Adam and Eve hypothesis. It is easy to have misleading intuitions about the population genetic effects of a short, sudden bottleneck. For example, Ernst Mayr suggested that many species had passed through extreme bottlenecks in founder events. He argued that extreme loss of diversity in such events would promote evolutionary change. Mayr’s argument about extreme loss of diversity lost much of its force when population geneticists (M. Nei, T. Maruyama and R. Chakraborty 1975 Evolution, 29(1):1-10) showed that even a bottleneck of a single pair would not lead to massive decreases in genetic diversity, if followed by rapid population growth. When two individuals are taken at random from an existing large population, they will on average carry 75% of its heterozygosity (M. Slatkin and L. Excoffier 2012 Genetics 191:171–181). From a bottleneck of a single fertilised female, if population size doubles every generation, after many generations the population will have over half of the heterozygosity of the population before the bottleneck (Barton and Charlesworth 1984, Ann. Rev. Ecol. Syst. 15:133-64). If population growth is faster than this, the proportion of heterozygosity maintained will be higher. Thus, a short, sharp bottleneck followed by exponential population growth would not doom a species to the fate of Tasmanian devils. …scientists have many other methods at their disposal to measure just how large our population has been over time. One simple way is to select a few genes and measure how many alleles of that gene are present in present-day humans. Now that the Human Genome Project has been completed and we have sequenced the DNA of thousands of humans, this sort of study can be done simply using a computer. Taking into account the human mutation rate, and the mathematical probability of new mutations spreading in a population or being lost, these methods indicate an ancestral population size for humans right around that 10,000 figure. In fact, to generate the number of alleles we see in the present day from a starting point of just two individuals, one would have to postulate mutation rates far in excess of what we observe for any animal. As Venema gives no references to the literature here it is hard to interact with him in detail, so I will make some general comments. A maximum of four alleles can pass through a bottleneck of two individuals. At the level of single nucleotide polymorphisms (SNPs) this is not such an issue as the maximum number of alleles possible at a SNP is four (A, T, G or C), and most common human SNPs are biallelic anyway (1000 genomes project). When we consider a contiguous sequence of DNA, such as a haplotype of a gene, more than four alleles are common, but these can arise through recombination of ancestral SNPs (in which case we have to ask if patterns of linkage disequilibrium fit with a bottleneck – upon which more below) or through new mutations. We need to bear in mind that explosive population growth in humans has allowed many new mutations to rapidly accumulate in human populations (A. Keinan and A. G. Clark (2012) Science 336: 740-743). Hyper-variable loci like MHC genes or microsatellites have so many alleles that they seem to defy the idea of a single couple bottleneck until we consider that they have very rapid rates of evolution, and could have evolved very many alleles since a bottleneck. The results indicate that we come from an ancestral population of about 10,000 individuals— the same result we obtained when using allele diversity alone…this approach scaled its analysis to investigate our lineage from the present dating back to approximately 200,000 years ago, which, as we will discuss later, is when our species first appears in the fossil record [Venema does not consider Homo erectus to be human]. The researchers found that, during this period, humans living in sub-Saharan Africa maintained a minimum population of about 7,000 individuals, and that the ancestors of all other humans maintained a minimum population of about 3,000— once again, adding up to the same value other methods arrive at. This is a rather inaccurate presentation of the paper. The paper’s discussion starts with the sentence: “Overall, the estimates of Ne appear to be much lower than the usually quoted value of 10,000”. It seems to me that the paper gives no warrant for Venema’s addition of effective population sizes above and below the Sahara, as it explains that the non-sub-Saharan populations contain a “subset of the amount of genetic variation present in the African population” due to an out-of-Africa expansion. It is the ancestral sub-Saharan estimate that therefore of main interest to us. The mean estimated Ne for this population among chromosomes is 6286, with a standard deviation of 1357. This study depends critically on knowing the recombination rate of the populations. Recombination rate is used both to calculate effective population size (from LD) and to estimate the time point that this is being measured for (from distance between loci). But the main method used to estimate the recombination rate by the authors is patterns of LD. Linkage disequilibrium patterns are also being used to calculate the effective population sizes given a known recombination rate. A degree of circular reasoning seems to be inevitable here. When the authors use a slightly different method to estimate recombination rate (which also relies upon measures of LD), all their estimates of Ne dropped by a mean of 27%. Thus, with the best will in the world, all we have here are ballpark figures for past effective population sizes. I am sure the authors of the study would not view their results as being of equivalent certainty to heliocentrism. Obviously, however, the paper at no point gives an effective population size estimate as low as two individuals. Does this therefore disprove the hypothesis of a bottleneck of two? I don’t think so, because such a scenario is simply not on the radar of the methods employed. The methods assume that the populations at any given time point are at equilibrium and not expanding exponentially (the authors deliberately exclude the last 10,000 years from this analysis as they know that exponential population growth has occurred in this timeframe). It is hard to see how they could pick up on a short, sharp bottleneck even if one had happened. It would be nice to see this modelled, just to check. Even if the results of this study are entirely correct, the authors do not make any statements about population size more than 200,000 years ago. This would appear to leave open the possibility of a bottleneck in the previous 5.8 million years. ...simulations did, however, reveal a limitation of PSMC in recovering sudden changes in effective population size. For example, the instantaneous reduction from 12,000 to 1,200 at 100 kyr ago in the simulation was spread over several preceding tens of thousands of years in the PSMC reconstruction. More recently, some simulations by a graduate student have shown that the PSMC method does not detect short, sharp bottlenecks, such as those caused by a pandemic or natural disaster. Thus I cannot see that PSMC analyses (many more of which have been done on human genomes since the original paper by Li and Durbin) can be cited as rigorously disproving a short, sharp bottleneck. Venema makes an argument based on incomplete lineage sorting among humans, apes and gorillas, which gives a large estimated effective population size. This argument is not relevant if we are only interested in the human lineage (the occurrence of ILS does not require maintenance of large populations sizes in every lineage after speciation and so does not exclude a bottleneck in the exclusively human lineage). The question asked by my religious friends is different to the questions being asked in the studies discussed above. My religions friends are not asking me if it is probable that humans have ever passed through a bottleneck of two; they are asking me if it is possible. None of the studies above set out to explicitly test the hypothesis that humans could have passed through a single-couple bottleneck. This is what we need to nail this issue down. I would very much appreciate feedback from scientific readers of this blog. I have dealt with arguments made in a single book chapter, that has addressed this issue more directly than any other source I have come across. 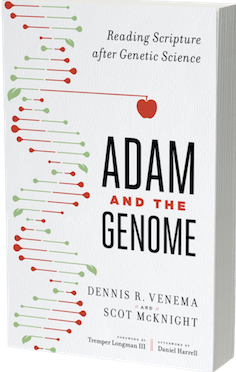 The author, Dennis Venema is the go to expert on this issue within the organisation Biologos, set up by Francis Collins (now director of NIH) to explore science-faith issues, so he ought to know what he is talking about. However, there may well be other, perhaps better, arguments that Venema has not made and I have therefore not interacted with. If I am missing something, then I would very much like to know. Whilst this issue may seem trivial to many readers, for large numbers of religious believers in the world, this is a critical issue. Do they really face a binary choice between accepting mainstream science and believing that humans have, at some point in their history, all descended from a single couple? I am open to the possibility that they do face this dilemma, but I need more evidence before I am persuaded. A stimulating read, thank you. I cannot be of much help with your questions, but I think it is premature to discount a bottleneck. With respect to mtDNA alone, the paper by Parsons et al, (1997, A high observed substitution rate in the human mitochondrial DNA control region, Nature Genetics 15:363-368) suggests a mutation rate ranging from 0.1-1.0 per person/generation. Yet Oppenheimer in his book 'Out of Eden: the peopling of the world' (2003) suggests "...about one mutation every thousand generations" (p.38) and footnotes (p.380): "This mutation rate applies if one takes the HVS 2 segment of the mtDNA control region normally studied." But I'm ignorant as to whether rates tend to vary wildly within different regions of mitochondrial genomes ... To hazard a guess I would say they do vary, which might explain such discordant figures, but I'm rather behind on my reading in this area. Can you shed more light?